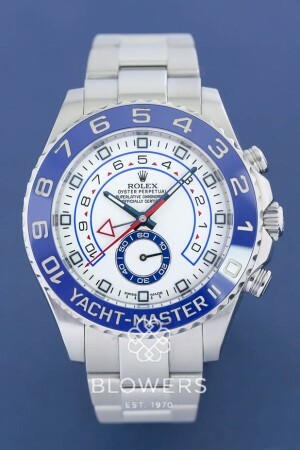 Rolex Oyster Perpetual Yacht-Master II 116680. Rolex Oyster Perpetual Yacht-Master II Regatta Chronograph. Model 116680.Case diameter 44mm water resistant to 100 meters. Automatic Rolex Caliber 4161 movement with 72 hour power reserve. White dial displaying Hours, minutes, subsidiary seconds, programmable countdown function with memory. Steel Oyster lock bracelet with comfort adjust. Box and papers dated November 2016. Rolex Service Papers dated September 2017. SKU: 3108972. Categories: Gents, Rolex, Yacht-Master II.